Mental Disorder: Cultural or Biological? Are mental illnesses biological or cultural? Do they emerge from a malfunction of brain development or biochemistry, or are they a product of the society in which they appear? The answer to that question has profound implications for a science of mental health. If mental illnesses are primarily biological in origin, then effective treatment must at some level have a biological impact – and an edge is given to strategies that focus directly on the body: pharmacology, surgical interventions, and the like. The edge is not an outright win: Type 2 Diabetes is unquestionably a biological ailment, but it is often managed behaviorally; ditto chronic pain, much heart disease, and many other documented physical conditions. If mental illnesses are predominantly cultural/psychological in origin, then treatment must surely address life and lifestyle rather than relying exclusively on pharmacological assists. One of the battles in mental health currently has to do with the reliance on antidepressant medication for depression in cases where the decline in mood and motivation seem clearly tied to circumstance. In a related vein, the answer might be important in guiding public education efforts. If a biologically-caused and easily-treated disease sits, undiagnosed, in a population, then it makes perfect sense to spread awareness and try to ferret out the hidden cases so that they can be resolved. If a disorder is cultural, public education efforts might inadvertently “spread the culture,” resulting in more cases. The fashions we see in mental illness – hebephrenic schizophrenia, bulimia, glove anaesthesia – suggest that we may be dealing with memes rather than genes. In Crazy Like Us (reviewed earlier here), Ethan Watters documents the apparent spread of previously-rare anorexia nervosa in Hong Kong society following a well-intended public education campaign. Some clinicians, myself among them, now regret having taken part in “Depression Screening Day,” an annual patient-finding exercise funded in part through the altruism of the pharmaceutical companies who would then profit from selling product to the (almost invariably subclinical) cases thus discovered. It seems clear that the answer varies by illness. No one doubts the biological component of Down Syndrome, nor the experiential element in post-traumatic stress disorder, for example. One disorder that most clinicians believe to be predominantly biologically-“loaded” is bipolar disorder. One reason for this is the often-miraculous effects of an appropriate dose of lithium in resolving a manic episode. Another is the existence of accounts of what can sound like bipolar disorder in the historical record. Cases described by Hippocrates, are often repeated at conferences as clear evidence that bipolar disorder is a “real” – that is to say biological – disorder, one that has been with us for millennia but only properly understood recently. David Healy is widely known as a psychiatrist and historian of psychopharmacology – and as a harsh critic of the role of the pharmaceutical industry in the research and testing of its own products. As a part of the Johns Hopkins University Press series of “biographies” of diseases he has traced the appearance of mania, melancholia, and bipolar disorder from Hippocrates to the present in a fascinating act of medical detective work that reads – at least to mental health nerds – like a whodunit. Maybe a whohasit or a whatisit. Is this an early case of bipolar 1 disorder? Healy fills in the ellipses from Hippocrates' account with the deleted details, including fever, spasm, severe pains, and black urine “with substances floating in it.” Suddenly the bipolar picture dissolves, and the details recounted in modern times seem almost to have been deliberately selected to tell a story, as though they were cobbled together by a team from Fox News. 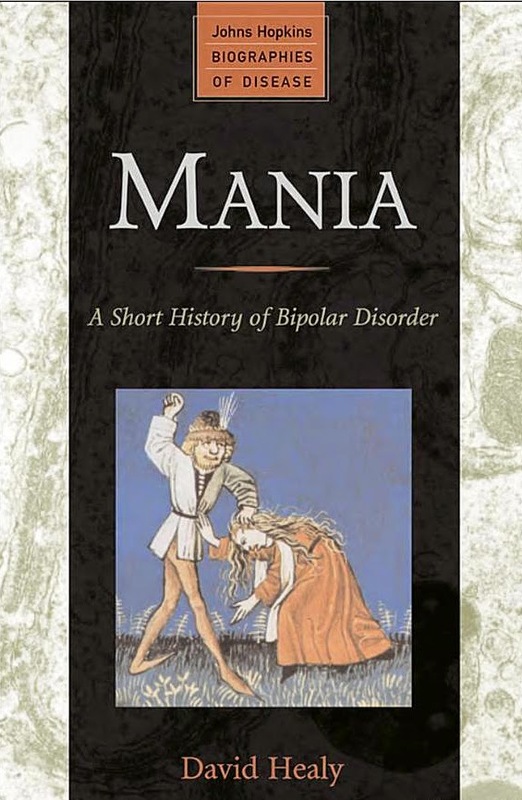 Healy shows that most of the ancient cases held up as examples of bipolar disorder do not fit the description of the modern ailment. Presentations that sound a bit like mania were more likely delirium, and many of the cases – particularly the postpartum ones - seem to have involved severe infections. Well, so what? The ancients didn’t know what they were looking at, so it’s no surprise that they confused things. But Healy points out that very clear descriptions of other diseases can be clearly identified in the writings of Hippocrates and others. He makes a case that the search for historical precedents for bipolar disorder has been subject to a profound case of confirmation bias – if not outright distortion. As he continues to trace its history, bipolar disorder shimmers at the edges and fades as a distinct ongoing entity. From ancient times Healy jumps fairly quickly to the 1800s, where he picks up the thread, looking at writers attempting to delineate the boundaries of mental normalcy and illness. He covers the creation of the asylums and the types of difficulties that might land a person within their walls. He talks about early psychiatrists, the alienists, who seem to have described mania and manic depressive illness first. He goes into detail on the lives and contributions of early classifiers of the types of disorder, including Falret, Baillarger, Kahlbaum, and (eventually) Emil Kraepelin. Some of the best passages in the book concern the files of the Denbigh Asylum in North Wales, opened in 1848 and serving an area that had a relatively stable population for over a hundred years. This multi-year time capsule offers the opportunity to review shifts in symptomatology and diagnosis over time – and raises questions about the incidence of bipolar disorder. “Sifting through 3872 admissions from North West Wales between 1875 to 1924, it becomes clear that bipolar disorder patients are hard to find. Only 127 such patients were admitted for the first time during this period. This gives rise to 10 cases per million per year, a rate that remained constant across fifty years and continues to hold true to today.” (p. 86). The second half of the book focuses on the treatment of bipolar disorder, including the discovery of lithium’s effects and the subsequent adoption of a variety of other medication-based approaches. This area, the history of psychopharmacology, is Healy’s great forte and his grasp of both the published literature and the backroom politics seems formidable. Healy reviews how marketing strategy dictated much of the professional education about bipolar disorder for decades, and how this shaped the field and the public consciousness (including the spread of the previously-unheard-of practice of diagnosing very young children with bipolar disorder, then commencing medication treatment using antipsychotics). Healy’s sense of outrage is palpable regarding how profit motives have distorted the careful development of knowledge about mental illness and its treatment. In reserved though sometimes acid prose, he builds his case that although bipolar disorder is a genuine and treatable condition, it has been subject to such marketing pressures that it has become difficult to see the reality through the haze of disinformation. The book is seemingly focused narrowly on mania, making it appear to be a marginal reading choice for most clinicians. But Healy has expanded the topic well beyond these boundaries, creating a sweeping and entertaining history of mental health as a whole. He does not shy away from controversy, and it is clear he has no great fondness for the present state of his field. I sometimes wonder what I would say if someone asked me for a mental health syllabus – something that no one is ever really likely to do. This book would unquestionably be on that list. In fact, I would regard it as essential reading for any clinician treating the mood disorders.